PRESS RELEASE: Native Instruments today introduced The Mouth, a unique performance instrument and sound processor by electronic artist and musical innovator Tim Exile. Based on versatile Reaktor technology, The Mouth generates intriguing melodies and harmonies from any audio signal on the fly, allowing it to easily turn vocals, drum loops and other sources into rich electronic textures and highly original sonic mayhem. The Mouth is the second instrument collaboration between Native Instruments and Tim Exile, following the notorious keyboard-controlled effects processor The Finger and originating from the same custom Reaktor-based live setup that is at the center of Tim Exile's boundary- breaking stage performances. Equipped with automatic pitch detection and intuitive harmonizing controls, The Mouth provides an unlimited array of expressive and inspirational synthesizer, vocoder and talk box- style sounds and effects with a distinctive electronic character, offering new and original ways to enrich an incoming audio signal or even turn it into something entirely different and unpredictable. The Mouth offers separate "Pitch" and "Beats" modes for tonal processing of all kinds of audio material, enabling anything from auto- tuning effects to unexpected chord structures and arpeggiated melodies. For flexible harmonization, musical scales can be either preselected or triggered in real time from a MIDI keyboard. The input signal can be seamlessly mixed and replaced with the output from separate "Synth", "Bass" and "Vocoder" sections, complemented by an additional "FX" path. Each generator section offers a convenient preset matrix with additional editing options, while eight global performance controls make it easy to tweak the overall sound in a spontaneous and intuitive way. 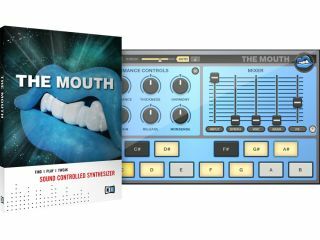 The Mouth is based on advanced Reaktor technology, and can be used with the free Reaktor Player and in the full Reaktor 5.5 software, both as a standalone processor and as a plug-within a DAW or music sequencer. The Mouth is available for download purchase in the NI Online Shop for $79 / 69 €.